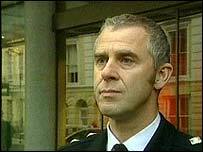 Steve, the British Transport Police Inspector who you may remember me writing about before phoned me up to tell me he is getting an M.B.E from the Queen in the New year's honours list! Here is Steve looking very serious. I had read on BBC news online about Steve - and later I found out more, which is quite hard because Steve is an extremely modest man. On July 7th, Steve was on duty at Kings Cross as part of his G8 duties. He heard the explosion beneath his feet, he hurried straight to the platform when he saw smoke billowing out of the south-bound Piccadilly line tunnel. He told his younger colleague Gerard, to stand guard and wait in case he didn't come back, in which case to report him as a casualty and seal the station. Steve then began running into the smoke-filled tunnel to help the people of the Kings Cross train, not knowing whether he was running into a fire or a second set of bombs or a biological attack - just running to help. Heading straight into danger. I badly wanted to meet Steve, and so did many of my fellow-passengers, and we were delighted when we finally met him. The first time I met Steve was on November 1st, the day of the Memorial Service. Earlier that day, I had grabbed an official-looking copper chap with lots of silver bits on his uniform (who turned out to be the Chief Constable) before the Memorial Service, asking if he knew Steve and if so, he must let Steve know that Kings Cross United wanted to buy him a drink. I am pleased to say that the Chief Constable did indeed pass this message on faithfully, and Steve came to the pub and met lots of grateful passengers from the train. I showed Steve the KCU book we have where we marked where we stood on a plan of the train. Over 80 people's names are there, across five pages. 'Look at all those names,' I said, 'you helped them all get off - they're all here - because of you'. It was all very emotional and Jane and I ended up leaping on Steve and giving him a hug. Since then Steve has been a member of Kings Cross United and we are extremely proud to have him amongst us. It is his calm voice saying 'Ladies and gentlemen, I am a police officer' that so many of the passengers remember as the first thing that gave them hope as they stood trapped in the smoke and darkness deep underground, not knowing if anyone official knew about them, waiting to be rescued because they could not get off the train trapped in the narrow tunnel. Steve got all the passengers who could walk safely off the train, and Gerard who had been told to stay behind and had to wait anxiously on the platform could then take over and help them, which he did brilliantly, and the July 7th rescue operation began to swing into operation. Steve then made his way to the last carriage of the train - carriage one - forced open the damaged interconnecting door, and saw 'what no amount of training will prepare you for' and what he 'will never talk about, out of respect for those people and for their families'. There were still some people alive on carriage one though, who were not able to evacuate through the driver's cab or through the back of the train. Steve had to tell them that he had to leave them but would be coming back with medical help. It was he said, 'the hardest thing I have ever had to do' and 'went against my moral fibre'. But Steve on his own couldn't help the injured, and the decision he made to leave them to bring help for them was absolutely the right thing to do. So this entry at the end of an extraordinary year is dedicated to Steve, Gerard, Tom the train driver, ( who are all in KCU) David the Russell Square station supervisor who also ran into the tunnel to help, Carrie and Anna the passing nurses from Great Ormond Street hospital who ran to help the injured at Russell Square platform, Aaron and the rest of the crew of Blue Watch Euston and Soho fire service, and all the people I don't know the names of or haven't met who helped us on that day. Thank you so very much. There aren't really words. The difference between a hero and a decent human being is very very small. Sometimes, it is no difference at all. ...but in this case, I 'd say that Steve ran into a tunnel belching smoke, into a fire, or a bomb, or a bio attack - and that crosses a line into heroism. He has a family. He knew he might not come back . He told his colleague not to follow him. He still deals with what he ran into. PC Gerard, who had to wait for Steve as instructed, and then led dazed survivors to safety is hero in my opinion - and I wish he had a medal too. I'm the first to vriticsie teh police when they get it wrong - but these two guys were a credit to the force and a great example to everyone not only police officers. The word hero is often tossed around loosely but these two guys provide the measure for using the word hero. I feel awful about this. Tom is a hugely valued member of KCU and I have written how thrilled we were to meet him at the pub on Nov 1st and after. Ray, what you and Tom did on that day was extraordinary. I always thought Tom did not want any fuss from the media and had avoided them for that reason, it is so sad to find out that he feels that he has been forgotten, because for me and the other members of KCU he is absolutely a hero. The reason I have not gone on about Tom in the blog was because I didn't want to mention his surname and I didn't know your name at all. Giving out your surname means that a lot of conspiracy theorists who are obsessed with re train times and what happened will try to contact you. So I might need to edit your comment to take yours and Toms secomd names out - if you are reading this can you let me know whether you are happy for your name to remain public domain even if it brings unwelcome attention? I will email Tom and pass on my thanks to hin once again, and you are very welcome to meet the passengers this Saturday when we would love to buy you a drink and thank you for your bravery. If you email me at kingscrossunited AT yahoo.co.uk then we can discuss next steps. And once again, thank you both. For everythign you have done, including telling me this. Thanks for your comments. I am sorry that I may have caused any misunderstanding. I think Tom has always valued the contact with various victims and spoke to me on the phone only a few days ago. It is the apparent lack of recognition from the authorities that has upset and angered him. I read that Inspector Mingay was quoted as saying that "No amount of training could have prepared me for what I saw on arrival at the scene." What effect did all this have on Tom who like the vast majority of staff and passengers are not trained to handle scenes of carnage and major devastation? He was fuming when he called me as his parents had just heard an interview with the supervisor of Russell Square Station. He describes the train driver (me, not Tom) appearing out of the tunnel with injured passengers, and being in a state of hysteria! Certainly not too hysterical to stop one lady being given a drink of water when she declared she had a chest injury and could drown if her lung(s) were punctured, or calling the Line Controller on the emergency number to try and get the lifts working to aid the rescue. Tom has valued any contact with victims or their relatives and I regret any confusion or upset I may have caused. Tom very much wants to get back to work, though it won't be train driving again. I can understand this as I still find it difficult at times, especially leaving Kings Cross on the Westbound, something we do at least twice a day! I have serious problems with certain types of people joing my trains, especialy if they are carrying large rucksacks etc. I have no problem with you using my name, the conspiracy nutters can say what they like. A drink sounds fine to me, we really must put some dates together for the very near future! then we can all say thanks for your efforts in person! What is your point Numeral? What do you want us to 'think about'? Can you make yourself clear? That is utter, utter crap. I'm sorry, but that's just rubbish and nonsense. Ray and Tom were driving 311, the one that blew up, with Gill and Garri Holness and everyone who died. I have said that you people can please keep your fantastical imaginings to the two threads about conspiracy theorists: I am going to warn you here, that any more comments on any more entries will be deleted. This is my blog, to a certain extent. my therapy, and a survivor resource. I do not have to put up with rubbish. Insensitive rubbish at that. Lies, in fact. You have been warned. From what I have read on here, surely it is the Metropolitan Police who should be accused of lying when they state they have no knowledge of Tom as the driver of the train, when he applied for compensation through his union? Or have I misunderstood what Ray Wright said? I'm sorry but I had to delete a few comments because they gave out the surname of the train driver of the Piccadilly line, 'Tom'. Tom was enormously courageous and calm on that day, helping us off the train and then going into the bombed carriage to tend the wounded and seeing terrible scenes. Tom's colleague Ray, who travelled on the train with Tom, made himself known to me last week - I didn't know that there were 2 drivers on the train, as Tom was the one who spoke to us whilst ray ran to get help. Ray boarded at Kings Cross. Ray visited this blog and made the point that Tom should be honoured , and he indeed should, in the opinion of me and many of my fellow passengers - and so should Ray for helping us on that day. They were both ace. However, because Tom is a private person I thought it best to remove posts with his surname on, to protect him from intrusion from media and, I am sorry to say, from conspiracy theorists . Some of these last have the madcap theory that there were no bombs, but power surges, some think that Tom was driving 'a train that did not exist' and that there has been a sinister cover up by shadowy global powers. All very paranoid, but I have had to take the comments down anyway, because intrusiveness is tiresome, even when you are anonymous like me. And if people email you or call you at work, because your surname and details are on the internet, with creepy questions about 7th July, it is all a bit much.